Kids Crafts : This teacher completely changes the lives of children in her class with ... tennis balls! 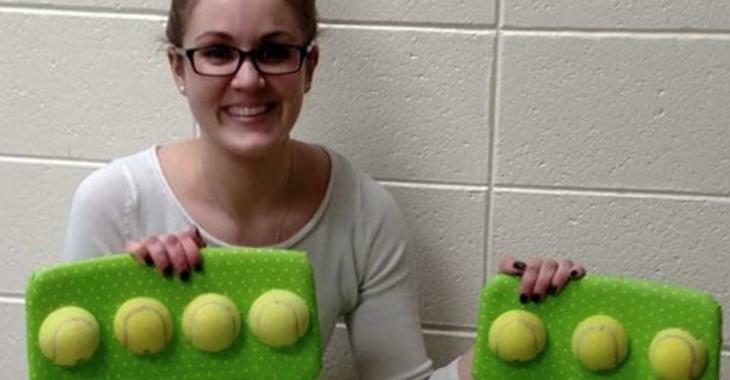 This teacher completely changes the lives of children in her class with ... tennis balls! This approach should be known in all schools! Amy Maplethorpe is a language specialist at a primary school in Illinois in the United States. . Among her students, she has children with autism who have significant sensory challenges..
She found an easy and economical way improve chairs for these children: she coated the back and seat of the chairs with Mod Podge, then she covered the seat and back with fabric, Then she cut Tennis balls in twoand she glued them to the back and the seat with hot glue to keep the balls in place. She explained that the balls on the back and the seat of the chair offer a texture that improves the sensory regulation. According to his experience, children with trisomy 21, Of sensory integration disorder and children autism take advantage of these alternative chairs. His students who have experienced it have become more patients, listen more guidelines and are less agitated. It is therefore an experience to repeat: Let teachers, schools, daycares, parents and all those who care for children in difficulty know. This trick is simple, it costs practically nothing to set up and it's the children who benefit directly.